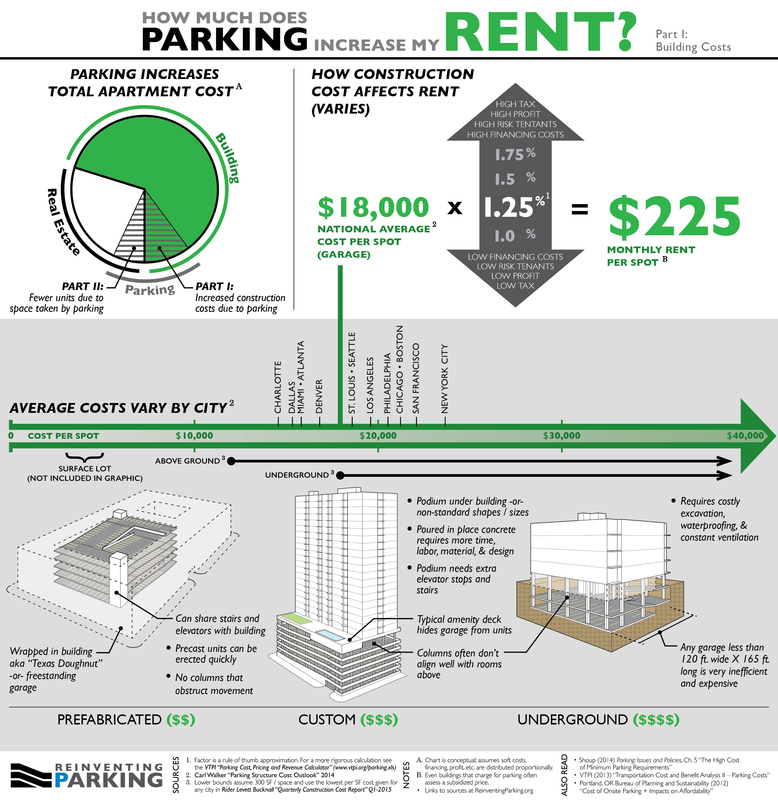 How much does parking increase rent? To read the article that originally accompanied this graphic, please click here. This space has been quiet for a long time as I moved continents, got married, and started engaging more in local urban activism. After a hiatus, I’ve gotten back to work on distilling the basic arguments in favor of parking policy reform into (hopefully) easy to share, easy to understand, yet persuasive graphics. This graphic was originally posted at Reinventing Parking, and I’m happy to say that I’ll be publishing all future efforts there. It seemed like a good idea to consolidate efforts on parking policy reform into a one stop shop so as to better reach more people in a more convenient platform. As such this space has become a bit redundant, and I don’t intend to write anything extra here to accompany the graphs from now on. I do intend to maintain Graphing Parking as a gallery of all my parking graphics and will simply link to the article at Reinventing Parking in the future. If you are interested in a deeper discourse on parking policy, I encourage you to unsubscribe from this blog and subscribe to Reinventing Parking. If you only came for the graphics, I will continue to post them here. This entry was tagged affordability, apartments, bundling, cost, development, economics, infographic, parking, rent. Bookmark the permalink.